Network Leads - Phase3 Website Builder Templates, Lead Capture Pages, Banners, Movies, $1! Watch This Quick Movie to Learn More! If you want to know even more about what you're getting, before you get started, click here to watch an extended version. Why start off at the beginning? Especially when you're in a hurry to increase your success, right? Get started for only $1 your first month! Go straight to the end, where the rubber meets the road! No need to purchase expensive domain names. We provide you with the links. Integrates with our LMS Lead Management System so you never lose track of a lead or contact again. No need for hosting, we do the hosting of your websites for you, saving you time and money. Dozens of template to choose from, with more being added monthly. Includes Youmongus Blog and the Youmongus Movie Maker to set you apart from the competition. Have direct access to Live Training Calls and Webinar Presentations. Use pre-built custom lead capture page forms and web pages for several different companies. Earn money by sharing this incredibly easy to use system with others! We are offering a $1 First 30 Days Subscription to our Phase3 Custom Template Website Builder and Lead Capture Page System! Q: Do I need any programming skills? A: NO! You get a WYSIWYG (What You See Is What You Get) editor on every template. Q: Do I need to host my own website? A: NO! We do the hosting for you, giving you freedom to choose from our domains. Q: Can I add my own content and images? A: YES! We even help you add images, banners, videos and more. 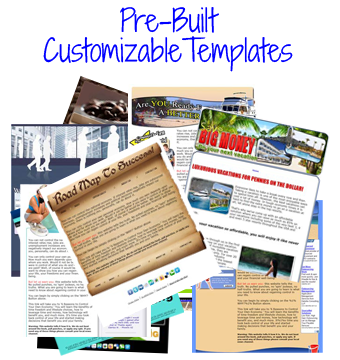 Blogs, Ads, Banners, Movie Makers, Lead Capture Pages, and more. Q: Can I share this with others and earn? A: YES! With our Building Fortunes affiliate system, you can earn by sharing our products with others. Normally the Phase3 System sells for $19.95 per month, but when you add up the value of getting a free blog, banners, movies, and more, that's like getting over $100 in tools monthly, for only $1 to start, and NO setup fees. We take the worry away... We show you how it works with Live Training Webinars and recorded training sessions where you can get direct answers from a live person. The best part about Phase3 is that if you can think it, and you can type it, you can have it right there, live on your website, ready for your leads and prospects to see. Does it take a lot of webmaster skills? No! If you can write an email, you can build a great capture page with Phase3. If you don't like writing the text or you're uncomfortable, then just use our pre-built templates, or get on our free training calls and learn how to develop a great training site for your team. You are only limited by your own creativity. If you don't see yourself as a winner, then you can't perform as a winner. Once you see how easy it is to use the Phase3 System, then you'll probably want to introduce others to it as well. Here's the Best Part... Get PAID, or Get it FREE! We want to reward you for sharing our leads, systems and training with others! We've been helping people just like YOU, with our Building Fortunes system. Building Fortunes is our affiliate system that allows anyone looking to earn some extra money, or share our great products and services, like leads, capture pages, custom websites, ad networks, blogs, banners, movies, MLM Training, Home Business Training Videos, telephone "icebreaker" scripts, and so much more. We should really be charging hundreds of dollars for access to all of this valuable information, but instead we choose to give most of it away for FREE! Why do we give so much away for FREE? Simple, we want to prove to people that they can build a substantial income on the Internet, by using systems and training that have been established and working since 1998. Now we don't say this to brag, we just want to prove our point, that working on the Internet can generate some extra income, or even a substantial income. We've been working on the Internet for over 15+ years, and in that time we've come to realize that some things work, and some things don't. So we know what works, and what doesn't quite as well. Since we've been around for a while, and we've seen what works (and the things that really didn't work at all), then we know a little (actually quite a bit) about how to get you on your way to building a fortune. Watch the FULL explanation of how it works here. What do people just like YOU have to say? "I just wanted to thank you for the time that you spent with me today. Though I've listened to, spoken with and have been coached by the so called "best of the best", I sense that working with you will be the most practical and meaningful training strategy that I have found." "This is a little preliminary, but I just listened to one of your QDC calls, and I get it, if I could show you how... would you? I like it, I have never thought of asking questions like that, and I have spent 10 years taking 20 minutes answering a question that belonged to a person who didn’t deserve my time and emotional energy. Thank you!" "We hope to have several people on next week, the training was wonderful, the system is THE MOST WONDERFUL SYSTEM we have ever seen. This training that you did this evening will open up doors for everyone, if they apply themselves with this AWESOME SYSTEM." "Peter: Of all the things that I like about you and your staff and your products, perhaps what I like best is your sense of humor. It is great to do business with your very professional organization without having to suffer with dull, dry and boring 'stuffed shirts!'" Okay so here you are... You have to decide if you're ready to start learning how to build your fortune. It all starts with just $1, and you sharing this system with others, and building your team of residual income builders. Of course here's where I'm going to throw in our Disclaimer, not all results are the same, and not everyone will become as financially independent as everyone else. Results are not typical, and it does take some hard work to become debt free and substantial wealth. I want to show you how you can reach those goals, and start putting it into a real time frame of possibility. Click on Add To Cart button to get started right now!